The following promotion is intended for participants in the United States (i.e. including Washington, D.C. and excluding Guam, Puerto Rico and all other U.S. territories and possessions) only and shall be construed and evaluated according to the laws of United States (i.e. including Washington, D.C. and excluding Guam, Puerto Rico and all other U.S. territories and possessions). Do not proceed in this promotion if you are not a legal resident of United States (i.e. including Washington, D.C. and excluding Guam, Puerto Rico and all other U.S. territories and possessions) or if you are not currently located in the United States (i.e. including Washington, D.C. and excluding Guam, Puerto Rico and all other U.S. territories and possessions). Further eligibility restrictions are contained in the Official Rules below. 1. 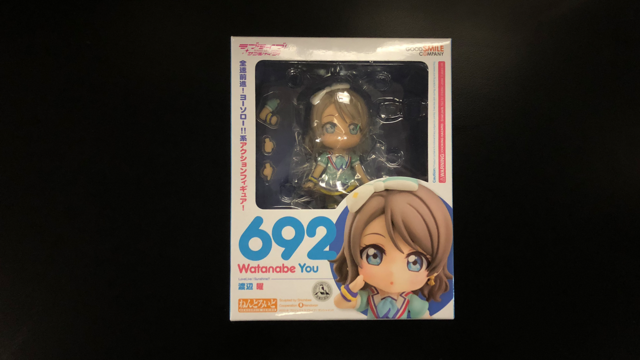 DESCRIPTION: The “You Watanabe Nendoroid” (the “Sweepstakes") offers entrants the opportunity to win the prizes described below. The sponsor of this Sweepstakes is Crunchyroll, Inc. ("Sponsor"), 835 Market St. Suite 700, San Francisco, CA USA 94103. Submission Period: The contest Submission Period begins on November 2(“Start Date”) at 11:00 am Pacific Time (“PT”) and ends on November 4 at 11:59 pm PT (the “Submission Period”). Potential Winner Notification: The potential winners will be contacted on or about November 5, per the description in Section Four (4) of the Official Rules. 2. ELIGIBILITY: The Sweepstakes is open only to legal residents of the United States (i.e. including Washington, D.C. and excluding Guam, Puerto Rico and all other U.S. territories and possessions) who are physically located and residing therein and who are at least eighteen (18) years of age and have reached the age of legal majority in their jurisdiction of primary residence at time of entry (“Entrant”). This Sweepstakes is not intended to solicit purchase of any materials required for play. Each Entrant must be the rightful owner of the email address identified in the Entrant's submission. In the event of a dispute as to the identity of a winner, the winner will be deemed the natural person in whose name the email account associated with the provided email address was opened. Employees, shareholders, officers, directors, agents, and representatives of Sponsor and each of its respective parent companies, affiliates, divisions, subsidiaries, agents, representatives and promotion and advertising agencies, together with the Immediate Family Members and/or Household Members (both as defined below) of such persons, are not eligible to participate in the Sweepstakes. For purposes of the Sweepstakes, "Household Members" shall mean those people who share the same residence at least three months a year, whether or not related; "Immediate Family Members" shall mean parents, step-parents, legal guardians, children, step-children, siblings, step-siblings, or spouses, regardless of where they live. Sweepstakes void where prohibited. 3. HOW TO ENTER: NO PURCHASE NECESSARY. Internet access required. During the Submission Period, follow @ShopCrunchyroll’s Twitter Channel (“Submission”) and ReTweet the latest tweet with the words “Flash Contest” included in its text. You will also be required to confirm that you have read, understood, and agree to abide by these Official Rules. Limited to one (1) entries per person for the duration of the Submission Period. Entrants must provide all information requested to be eligible to win. Winners will be chosen at random by the Sponsor. The winner shall receive one of the referenced items. All prize details are at the sole discretion of the Sponsor. Winner cannot assign or transfer the prize to another person. Cash alternative is allowed at the sole discretion of Sponsor. If a prize cannot be awarded due to circumstances beyond the control of Sponsor, a substitute prize of equal or greater retail value may be awarded. If winner cannot accept a prize, or any portion thereof, as stated, the prize may be forfeited at the sole discretion of Sponsor. The value of the prize represents Sponsor’s good faith determination of the maximum retail value thereof. No refunds or credit for changes are allowed. All other expenses and costs, not expressly listed above, including, but not limited to, taxes, tips, entertainment and transfers, are winner’s sole responsibility. The Winner will be solely responsible for all federal, state and/or local taxes, as applicable, and for any other fees or costs associated with the Prize they receive. The stated ARV of the Prize is based on available information provided to Sponsor and the value of the Grand Prize awarded will be reported for tax purposes as required by law. If the Winner is a US resident he or she must provide Sponsor with a valid social security number before the Prize will be awarded for tax reporting purposes. An IRS Form 1099 will be issued in the name of a Winner who is a US resident for the actual value of the Prize received. Other restrictions may apply. If prize is awarded but goes unclaimed or is forfeited by recipient, the prize may not be re-awarded, in Sponsor’s sole discretion. 5. POTENTIAL WINNER NOTIFICATION: The potential GP Winner will be contacted via Twitter Direct Message and/or Instagram Direct Message on or about November 5, 2018. The potential Winner will be required to respond as directed to the notification WITHIN 24 HOURS or the Entrant may be disqualified and a new potential winner will be selected according to the scores assessed by the Judging Panel during the Judging Period, who will be subject to disqualification in the same manner. Sponsor reserves the right to disqualify anyone not fully complying with the Official Rules. The potential Winner will be required to verify address and complete, sign, and return within seventy-two (72) hours an affidavit of eligibility or declaration of eligibility/compliance (as applicable), a liability release, and, unless prohibited by law, a publicity release and other legal documents as may be required by Sponsor in its sole discretion (collectively, the "Prize Claim Documents") covering eligibility, liability, advertising, publicity and media appearance issues. Failure to return the Prize Claim Documents within the specified time period may result in forfeiture of the prize and selection of the individual who submitted the Submission that received the next highest number of points as a new potential winner (and who will be subject to disqualification in the same manner). 6. DATES & DEADLINES/ANTICIPATED NUMBER OF SWEEPSTAKESANTS: Because of the unique nature and scope of the Sweepstakes, Sponsor reserves the right, in addition to those other rights reserved herein, to modify any date(s) or deadline(s) set forth in these Official Rules or otherwise governing the Sweepstakes. Sponsor cannot accurately predict the number of Entrants who will participate in the Sweepstakes. 7. NATURE OF RELATIONSHIP/WAIVER OF EQUITABLE RELIEF: Each Entrant understands and acknowledges that the Sponsors has wide access to ideas, stories, designs, and other literary materials, and that new ideas are constantly being submitted to it or being developed by their own employees. Each Entrant also acknowledges that many ideas may be competitive with, similar or identical to the Submission and/or each other in theme, idea, format or other respects. Each Entrant acknowledges and agrees that such Entrant will not be entitled to any compensation as a result of any Sponsor’s use of any such similar or identical material. Each Entrant acknowledges and agrees that the Sponsor does not now and shall not have in the future any duty or liability, direct or indirect, vicarious, contributory, or otherwise, with respect to the infringement or protection of the copyright in and to the Submission. Finally, each Entrant acknowledges that, with respect to any claim by Entrant relating to or arising out of Sponsor’s actual or alleged exploitation or use of any Submission or other material submitted in connection with the Sweepstakes, the damage, if any, thereby caused to the applicable Entrant will not be irreparable or otherwise sufficient to entitle such Entrant to seek injunctive or other equitable relief or in any way enjoin the production, distribution, exhibition or other exploitation of the Submission or any other production based on or allegedly based on the Submission, and the Entrant’s rights and remedies in any such event shall be strictly limited to the right to recover damages, if any, in an action at law. 8. RIGHTS OF SPONSOR/ DISCLAIMER OF LIABILITY: By entering or participating in this Sweepstakes Entrants waive the right to claim any ambiguity or error in the Official Rules or in the Sweepstakes itself. Sponsor reserves the right to modify these Official Rules, in whole or in part, at any time and without notice or obligation for clarification purposes without materially affecting the terms and conditions of the Sweepstakes, if, in Sponsor's sole opinion, any factor interferes with its proper conduct as contemplated by these Official Rules. If any provision of these Official Rules is found to be unlawful, void or for any reason unenforceable, then that provision shall be deemed severable from these Official Rules and shall not affect the validity and enforceability of any remaining provisions. Sponsor's failure to enforce any term of these Official Rules shall not constitute a waiver of that provision. Headings and captions are used in these Official Rules solely for convenience of reference, and shall not be deemed to affect in any manner the meaning or intent of these Official Rules or any provision hereof. Sponsor shall have the right and sole discretion to edit, to refuse to publish or cease to publish any Submission whatsoever which it finds to be in violation of these Official Rules, does not fully comply with all of Sponsor’s requirements in connection with any and all legal clearance issues, or which it finds in its sole discretion to be otherwise objectionable for any reason. Sponsor also reserves the right to replace the winning Submission with the Submission of an alternate eligible Entrant in accordance with these Official Rules if such Submission and/or Entrant is withdrawn from or removed from the Sweepstakes for any reason, including without limitation, Entrant’s failure to have documents executed as directed by the Sponsor. Sponsor also reserves the right, in their sole discretion, to adjust times and dates reflected in the Description Section of the Official Rules at any time and/or to terminate the Sweepstakes for any reason in the event that there is an error, problem or cause which impacts the operation, administration or security of the Sweepstakes or the Sponsor and, in such situation, to select the winner(s) from the eligible Submissions received prior to the action taken or in such manner as deemed fair and appropriate by Sponsor. The Sponsor is not responsible for any materials provided by Entrants that are deemed harmful or offensive to others or for any harm incurred as a result of the Submission creation. The Sponsor is not responsible in any way for any injury, loss or damage that occurs as a result of an opinion expressed or information provided in connection with the Sweepstakes. The Sponsor makes no warranties, express or implied, as to the content or the accuracy or reliability of any information or statements contained in any Submission. All statements and opinions made by Entrants are those of such Entrants only, and the Sponsor neither endorses nor shall be held responsible for the reliability or accuracy of same. Sponsor is not responsible for the content or practices of third party Web sites that may be linked to the Sweepstakes Website. This site may also be linked to Web sites operated by companies affiliated with Sponsor. Visitors to those sites should refer to each site’s separate privacy policies and practices. 9. WARRANTY: It is an express condition of submission and eligibility that each Entrant warrants and represents that Entrant’s Submission is solely owned by Entrant and solely created by Entrant for the purpose of entering this Sweepstakes, and that no other party has any rights or interest in the Submission. Entrant further represents and warrants that the Submission and any use thereof by the Sponsor, and each of its respective parent companies, subsidiaries and affiliates in connection with programming, advertising, promotion and publicity, shall not infringe upon any statutory or common law copyright and shall not constitute a defamation, or invasion of the right of privacy or publicity, or infringement of any other right of any kind of any third party. 10. RELEASE: By participating, each Entrant agrees that the Sponsor and each of its respective agents, representatives, parent companies, affiliates, subsidiaries, units and sponsors, divisions and advertising and promotional agencies and prize suppliers and all entities involved in the production, sponsorship and/or promotion of the prize, or any part thereof, including, without limitation, each of their respective employees, shareholders, officers, legal advisors and directors; and each of these companies and individuals' respective successors, representatives and assigns (“collectively, the “Released Parties”) are not responsible or liable for, and shall be released and held harmless from: (i) late, lost, delayed, damaged, incomplete, illegible, unintelligible, misdirected or otherwise undeliverable mail, postage-due notices, release forms, affidavits or other correspondence; (ii) telephone, electronic, hardware or software program, network, Internet or computer malfunctions, failures, or difficulties of any kind; (iii) any condition caused by events beyond the control of the Released Parties that may cause the Sweepstakes to be disrupted or corrupted; (iv) any printing, human, typographical or other errors or ambiguities in (or involving) any materials associated with the Sweepstakes; (v) any and all losses, damages, rights, claims and action of any kind in connection with or resulting from participation in the Sweepstakes; (vi) acceptance, possession, or use of any grant, including without limitation, personal injury, death and property damage arising there from; and (vii) claims based on publicity rights, defamation or invasion of privacy. Sponsor reserves the right, subject to any governmental approval which may be required, to modify, suspend, or terminate the Sweepstakes, to suspend or cancel the Sweepstakes at any time for any reason, including, without limitation, if a computer virus, bug or other technical problem corrupts the administration, security, or proper conduct of the Sweepstakes, strikes, lock-outs, acts of God, technical difficulties, and other events not within the reasonable control of Sponsor. Sponsor reserves the right, at their sole discretion, to prohibit any Entrant from participating in the Sweepstakes or to disqualify any individual they find, in their sole determination, to be tampering with the entry process or the operation of the Sweepstakes; to be attempting to undermine the legitimate operation of the Sweepstakes by cheating, hacking, deception, or any other unfair playing practices; to be acting in violation of the Official Rules; or to be acting in a disruptive manner, or with intent to annoy, abuse, threaten or harass any other person. Sponsor may suspend or discontinue the Sweepstakes if, in their sole opinion, there is any actual or suspected tampering of the Sweepstakes, or any other malfunction, event or activity that may affect the integrity of the Sweepstakes. SPONSOR SHALL NOT BE OBLIGATED TO AWARD ANY PRIZE THAT RELATES TO OR ARISES OUT OF IMPROPER OR MISTAKEN PRIZE NOTIFICATION, OPERATION OR FUNCTION OF THIS SWEEPSTAKES. 11. INDEMNITY: Entrant shall indemnify, defend and hold harmless the Released Parties from and against any and all liability, claims, loss, damage, injury or expense, including reasonable attorneys’ fees, arising out of or in connection with any third party action arising out of or in connection with (i) Entrant’s participation in the Sweepstakes, (ii) a breach or allegation which if true would constitute a breach, of any of Entrant’s representations, warranties or obligations herein, and/or (iii) acceptance, possession, or use of any prize related to such prize, including without limitation, personal injury, death and property damage arising there from. 13. ARBITRATION PROVISION: By participating in this Sweepstakes, each entrant agrees that any and all disputes the entrant may have with, or claims entrant may have against, the Released Parties relating to, arising out of or connected in any way with (i) the Sweepstakes, (ii) the awarding or redemption of any prize, and/or (iii) the determination of the scope or applicability of this agreement to arbitrate, will be resolved individually and exclusively by final and binding arbitration administered by the National Arbitration Forum (the “Forum”) and conducted before a sole arbitrator pursuant to the Code of Procedure established by the Forum. The arbitration shall be held at a location determined by the Forum pursuant to the Code of Procedure, or at such other location as may be mutually agreed upon by the participant and Sponsor. The arbitrator's decision shall be controlled by the terms and conditions of these Official Rules and any of the other agreements referenced herein that the applicable participant may have entered into in connection with the Sweepstakes. There shall be no authority for any claims to be arbitrated on a class or representative basis; arbitration can decide only the participant's and/or Sponsor's individual claims and the arbitrator may not consolidate or join the claims of other persons or parties who may be similarly situated. The arbitrator shall not have the power to award special or punitive damages against the participant or Released Parties. For more information on the Forum and/or the Forum's Code of Procedure, please visit their website at www.arb-forum.com. If any part of this Arbitration Provision is deemed to be invalid or otherwise unenforceable or illegal, the balance of this Arbitration Provision shall remain in effect and shall be construed in accordance with its terms as if the invalid or illegal provision were not contained herein. 15. WINNER/OFFICIAL RULES: To obtain a copy of the Winner list or a copy of these Official Rules, send your request along with a stamped, self-addressed envelope to “Weekly Crunchyroll Store Sweepstakes” Winners/Rules, 835 Market Street, Suite 700, San Francisco, CA 94103. Requests for the names of the winners must be received no later May, 2019. Pls add home video versions for all your anime. I know you have them for many series like SAO, Blue Exorcist but add for others too like replacing simulcasts with uncuts or providing both options. T___________T why u no like us?